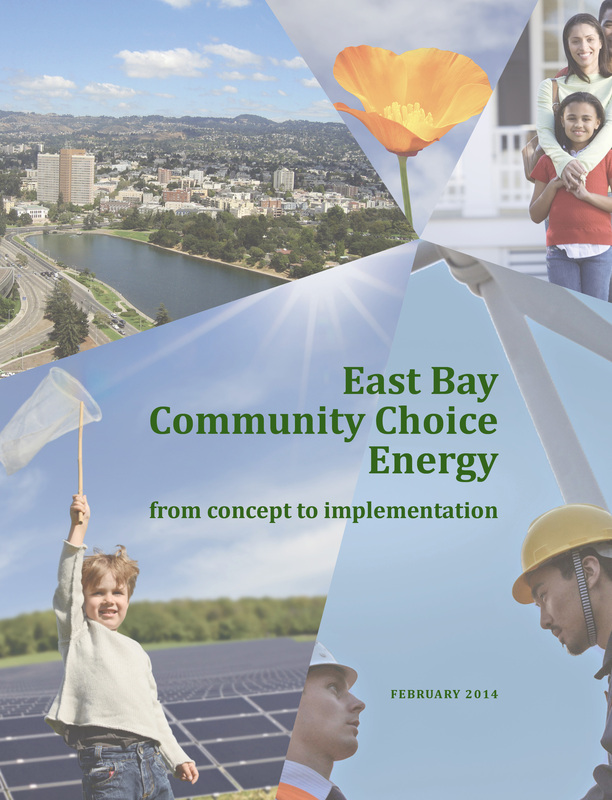 At its much-anticipated board meeting on Tuesday, December 11, East Bay MUD’s Board of Directors disappointed clean energy advocates by voting to discontinue further exploration of an East Bay Community Choice energy program. 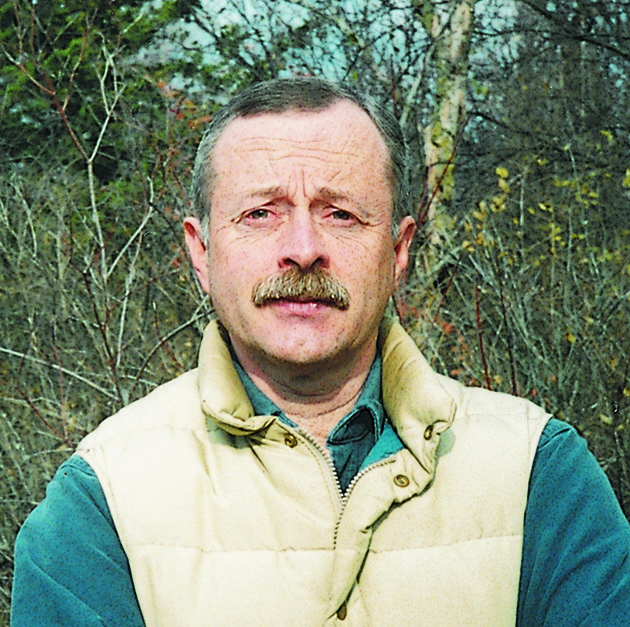 The decision came despite evident community backing for the agency to take leadership in establishing a Community Choice program. Much of that community support was mobilized through the efforts of the Clean Energy and Jobs Oakland campaign, which will continue its efforts to establish Community Choice in the East Bay despite the vote. The campaign has been reaching out since July to Oakland community organizations and businesses, and to city council candidates and incumbent members regarding the benefits that could come from a Community Choice program. Representatives from many of these groups appeared and spoke at the Board meeting or wrote letters to the East Bay MUD directors in favor of moving forward with Community Choice. Mobile Solar to the Rescue - You Can Help! Over a month after Super Storm Sandy, there are still parts of the East Coast that are without power. 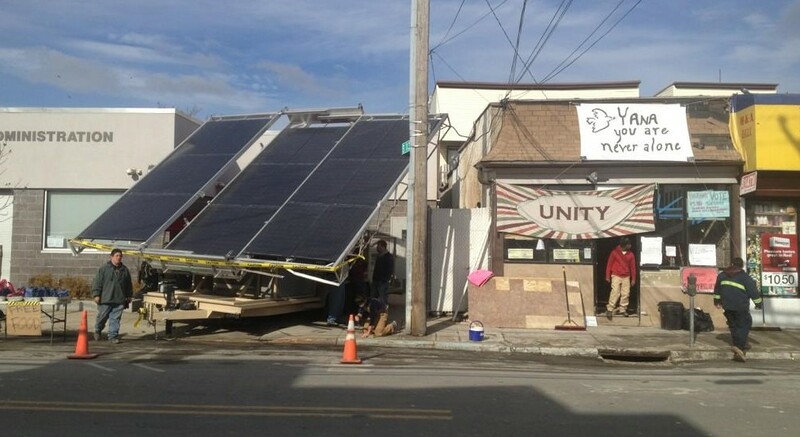 Luckily, a mobile, solar- powered generator, the Mojave-3, has been assisting rescue efforts in some of the hardest hit areas in the Rockaways, NY and Sandy Hook, NJ. The mobile solar array needs no hook up to the grid, can generate 4 kW with 100kW battery capacity and a back-up diesel-powered generator. So far it has provided electricity for a Greenpeace hot food kitchen, a medical clinic, a ranger station, and a charging station for cellphones, flashlights, and other critical equipment. Project ME4, a member organization of the Local Clean Energy Alliance, whose mission is developing mobile energy for emergency, education and enterprise, has started a crowd-sourcing campaign at Indiegogo to raise funds to keep the Mojave-3 unit operating. If enough funds are collected, they will ba able to add a second solar-powered unit to the relief efforts. Read more about Mobile Solar to the Rescue - You Can Help! Victory for Clean Power in San Francisco! On September 18th San Francisco took a huge step in meeting its climate action goals! 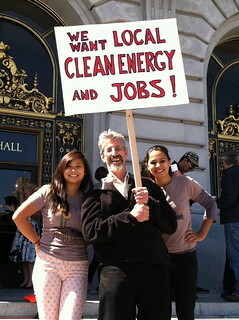 The Board of Supervisors voted 8-3 to approve CleanPowerSF, San Francisco's version of Community Choice Energy. 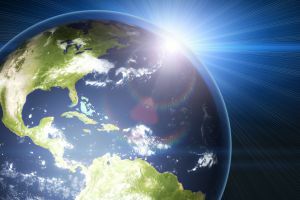 The Local Clean Energy Alliance and allies have spent years shaping the program and organizing the support to move it forward. 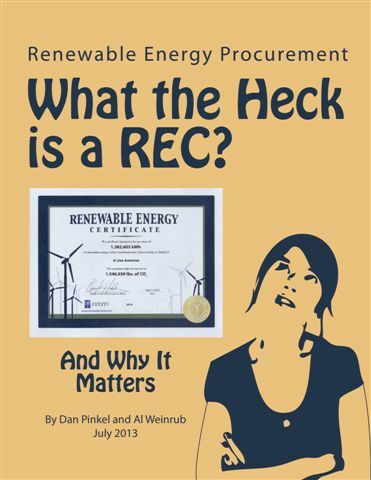 "This vote is a big victory in the 10-year effort to bring Community Choice Energy to San Francisco," stated Al Weinrub, Coordinator of the Local Clean Energy Alliance. "It's a crucial step in transitioning off fossil fuels in a way that provides economic opportunity and clean energy jobs." Read more about Victory for Clean Power in San Francisco! ***UPDATE*** Veto Effort Succeeds ! On September 27, 2012, Governor Brown decided to return AB 976 without his signature. He noted in his letter to members of the Assembly that AB976 is not necessary to protect against conflict of interest and would impede development of community choice programs. Thanks to all who helped make this veto effort successful. At the end of August, shortly after passage of AB 976 in the California legislature, the Local Clean Energy Alliance rallied 15 organizations to urge Governor Brown to veto the bill. 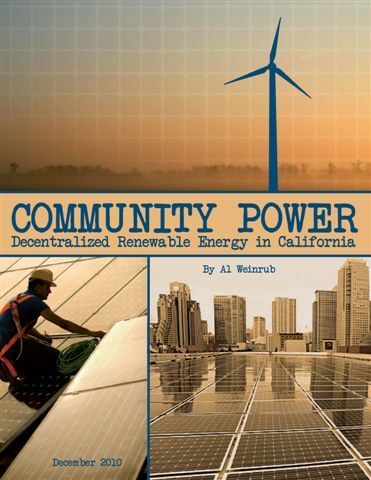 AB 976, the stealth anti-Community Choice energy bill, would undermine new Community Choice energy programs like the ones we are working to establish in San Francisco, Sonoma, and the East Bay. In response to the bill's passage, the Local Clean Energy Alliance drafted a letter urging Governor Brown to veto the legislation, and the Alliance reached out to other organizations to sign on to that effort. The Alliance is now calling on all individuals, as well, to contact the governor and ask him to veto AB 976. The Local Clean Energy Alliance’s third annual Clean Power, Healthy Communities conference drew 140 people on May 10 to a day of intense deliberations about the potential benefits of local renewable power to Bay Area communities and how to build a movement to realize those benefits. 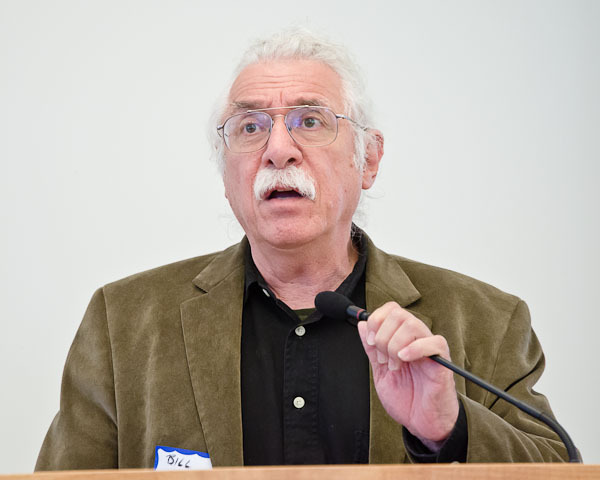 Check out photos of the conference and a video of the keynote address by Bill Gallegos. For those who are kicking themselves for not attending, you can also check out some of the conference presentations. Video of major sessions will be available soon. 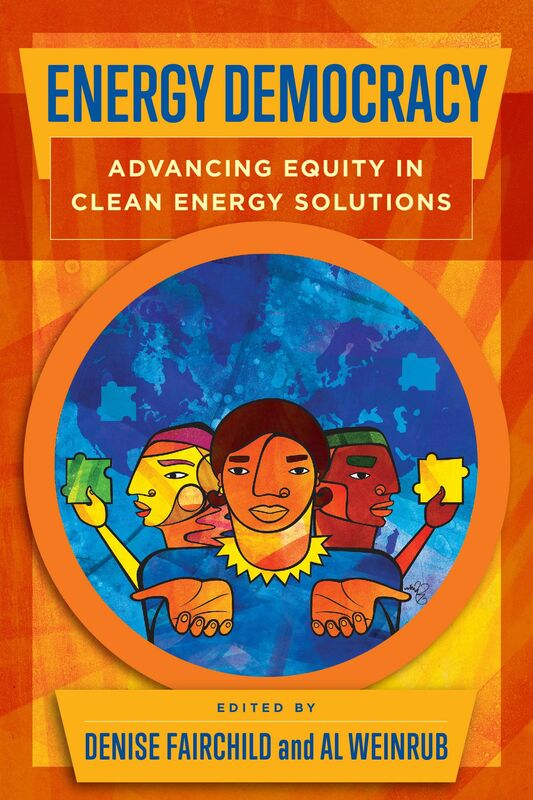 Spearheaded by the California Environmental Justice Alliance (CEJA) and authored by Assemblyman Paul Fong (Cupertino), AB 1990 would provide a 375 megawatt feed-in tariffs tariff program to promote 375 megawatts of small-scale renewable energy projects in disadvantaged communities in California by 2020. Is it possible over the next 8 years to convert 25% of Bay Area homes and businesses to zero net energy buildings, reduce greenhouse gas emissions from electric usage by 60%, and cut peak demand for electricity by 50%? Pacific Environment's report Bay Area Smart Energy 2020 (BASE 2020) provides a road map for doing just that. The Local Clean Energy Alliance’s March general meeting featured James Fine, of the Environmental Defense Fund (EDF), presenting a summary of EDF’s work evaluating Smart Grid deployment plans of California’s three Investor-Owned Utility (IOU) companies.